Paul Goncharoff writes about Russia’s blockchain industry and regulatory framework after attending an event devoted to Russia’s regulatory sandbox organised by the central bank together with the Skolkovo Foundation. 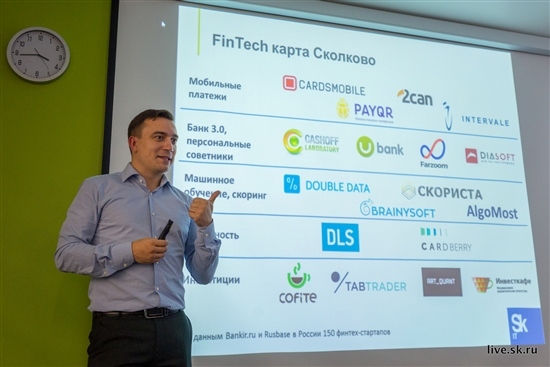 The event was attended by Pavel Novikov, head of Skolkovo's fintech and blockchain centre. Photo: Sk.ru. The week started in Moscow with an email containing a PWC survey that concluded 84% of companies are dabbling in blockchain. The next email was from the Central Bank of Russia inviting me to a small seminar unsurprisingly covering a very similar theme. The decisive factor was the fetchingly named seminar: ‘The Work of the Regulatory Sandbox’… who could refuse? As I do not believe in coincidences this started my mercantile brain to whirr. The conclusion was that I would be a fool not to attend and perhaps I will not only learn a bit more, but flesh out my personal understanding of blockchain technology applications. More to the point I advise a US company through its Russian registered arm in Vladivostok which is now going through this ‘sandbox’ (an analog old-school ‘platform’) for approval. The term ‘Blockchain’ is on everyone’s lips these past few years, yet unsurprisingly when I talk with my business acquaintances I hear any number of explanations and variations of just what blockchain is, and for whom. In short, few people are entirely conversant in the concept, but none is willing to be seen as being slow, uninformed or not on the blockchain bandwagon. In short, Blockchain is the technology that forms the foundation allowing cryptocurrencies and far more. It records transactions on a public, distributed ledger (DLT) and mostly obviates the need for a third party role. The technology is fast, predominantly secure, and applications are broadly tested for just about everything transactional. From property title, health records, asset control – just about anything involving the secure transmission and exchange of functional data, such as traditional banking, e-commerce through to cryptocurrencies. On the anxiety side, which applies to most every emerging technology, challenges plus doubts exist around blockchain’s reliability, speed, security and scalability. However, these same concerns are a daily challenge to businesses using established traditional systems, so I imagine it is a question of familiarity and comfort zones. The old beloved jeans vs. the new crisp ones. If fear is defined by not knowing an outcome, then trust, which was named as a major roadblock to blockchain adoption, is a matter of educated familiarity. A kitchen culture example would be using a Cuisinart after years of wielding a hand whisk… It is a significant shifting of gears to open broad new culinary vistas. At the practical level of adoption, the challenge worldwide for all users is regulatory uncertainty, legal position, compliance concerns, liability, and intellectual property risks as obstacles slowing blockchain adoption. This then was the crux of the sandbox seminar I was invited to this August 29 at the Corporate University of the Bank of Russia in the small town of Odintsovo just outside Moscow.